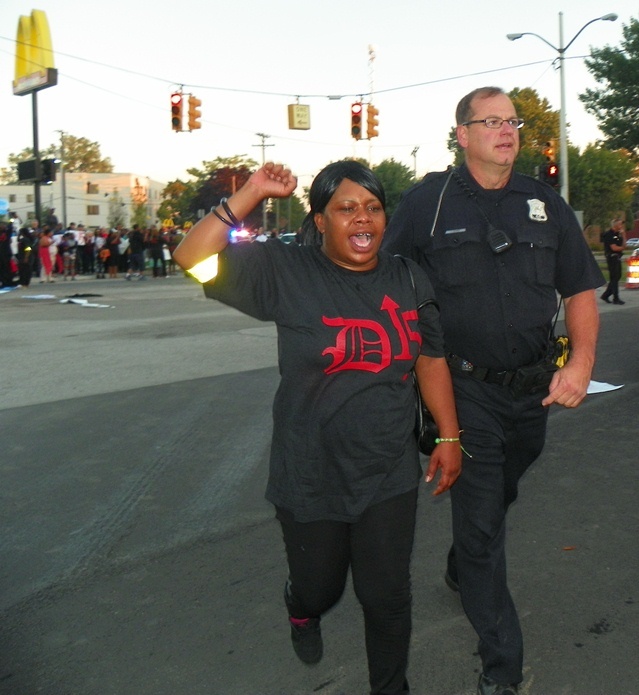 ← U.N.’S RACISM WATCHDOG COMMITTEE SLAMS DISCRIMINATORY POLICE BRUTALITY IN THE U.S.
DETROIT – Dozens of fast food workers, nearly all Black youth, were arrested today, after blocking the east-side intersection of Mack and Moran next to a McDonald’s restaurant to demand a $15/hr. wage with benefits, and a union. They were supported by large rallies on both sides of the streets, including home care workers, as part of a national day of civil disobedience against poverty-level wages. “Hey, hey, ho, ho, $8.15 has got to go,” they chanted. As a result of national actions since 2012, some fast food wages have increased a dollar an hour, but the workers said that was not enough. In a recent victory, the Service Employees International Union (SEIU) won a ruling from the National Labor Relations Board that McDonald’s workers are employees of the $200 billion global giant, not of individual franchises, strengthening their position. Coming on the heels of the two-week youth uprising against Michael Brown’s murder by police officer Darren Wilson in Ferguson, MO, actions in Detroit and across the U.S. infused more power into a growing youth movement that has not been seen since the 1960’s. 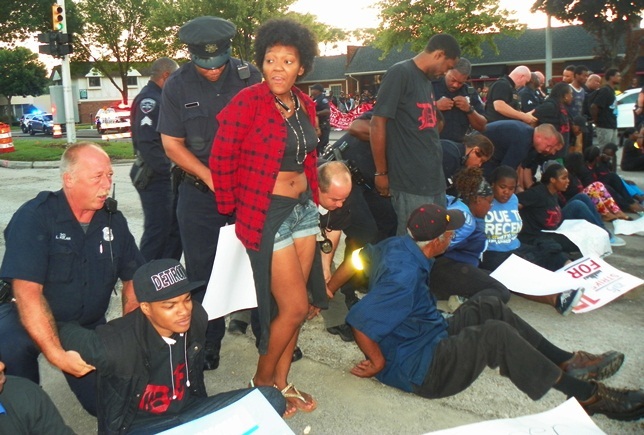 In Detroit particularly, arrests and harassment of Black youth are epidemic. Fully aware of this, the young protesters nonetheless sat down in proud defiance as dozens of police cars roared up. Then they stood up to be handcuffed, joy in the struggle and wariness of police treatment reflected in their faces at the same time. “I want to take care of my 6 month old baby and be able to pay my bills,” Nakisha Mosley, 20, a McDonald’s worker, told VOD. She was part of a small group of protesters that retook part of the street after the main arrests. “Fifteen dollars is just a start,” said Nathaniel Johnson, 26, who has worked at a fast food restaurant for the last nine years. 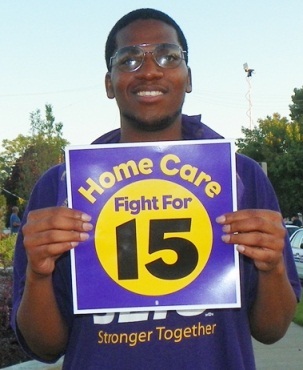 Home care worker Terance Carter. 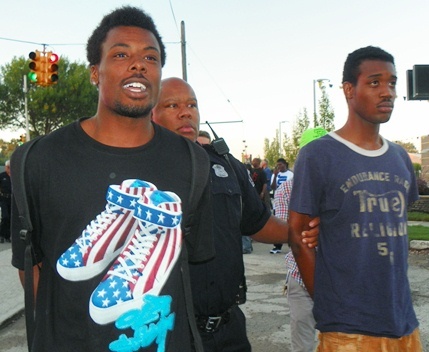 Police estimated arrests at around 30, but Pastor Willie Rideout of All God’s People Ministries in Detroit, an organizer of the protest, said he thought one hundred were arrested. 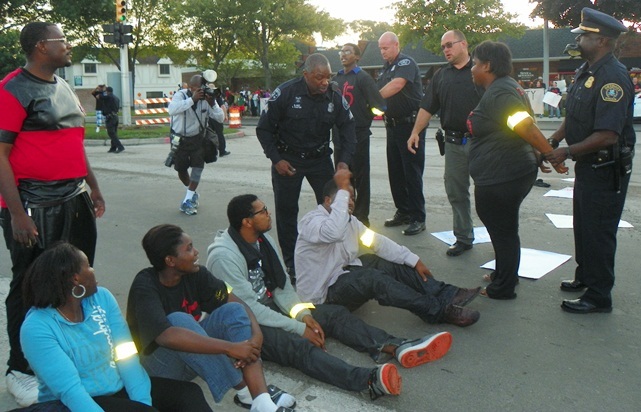 Police at the scene said the arrestees were being taken to the Mound Road Detroit Detention Facility (DDF). An officer in charge at the DDF told this reporter that only four protesters had been brought in there. He said most were being checked for warrants and other outstanding matters by the arresting officers, and then ticketed and released instead of being brought to the DDF. 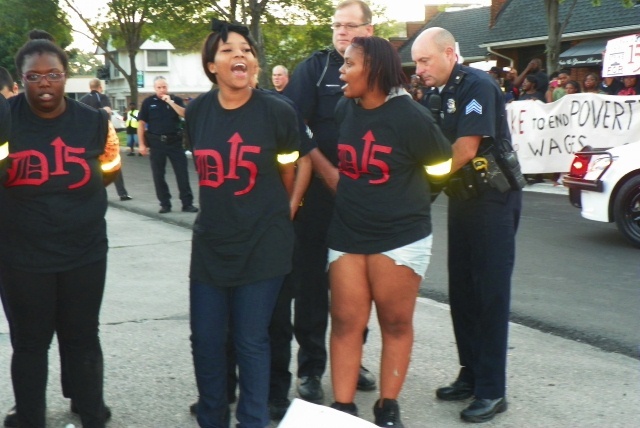 After the arrests, officers pushed sidewalk protesters from the Home Care Workers and other groups holding banners back across Mack and told everyone to get on the sidewalk near McDonald’s and begin dispersing. This reporter was threatened with arrest despite showing her media badge. 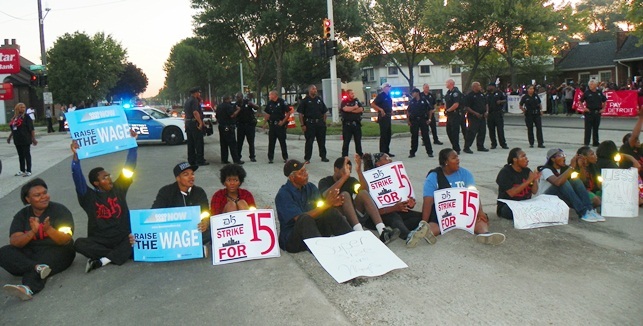 Over 1300 low-wage workers met at a national convention in Chicago in July to plan for today’s actions. Today, fast-food workers and allies in more than 100 U.S. cities will take to the streets to demand underpaid fast-food workers get the fair wages they deserve. 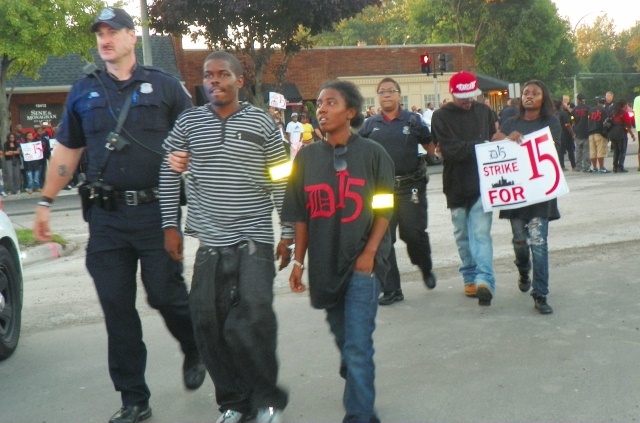 Workers are calling it #StrikeFastFood, and they plan to make good on their resolution to do “whatever it takes” to win, including engaging in non-violent civil disobedience in select cities. 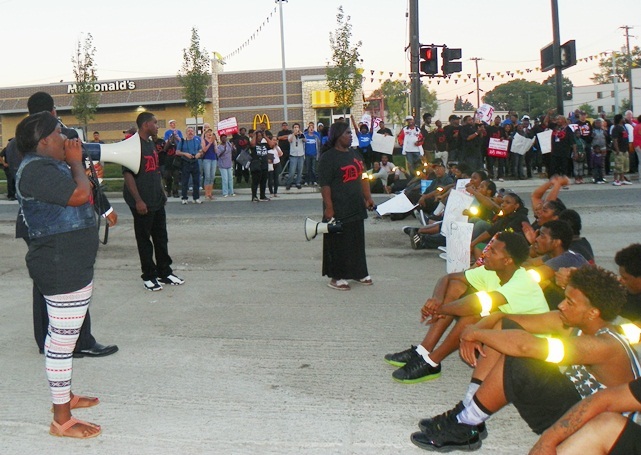 Fast-food workers across the country are on strike. We’re striking because no one who works for a living should be forced to live in poverty, not when we work for hugely profitable corporations. We’re striking because McDonald’s and the other fast-food giants continue to dismiss us, and refuse to give us the respect that any human being deserves. We aren’t just striking for better pay and respect, though, we’re striking to survive and we have no other choice. We’re willing to do whatever it takes to win $15 an hour and the right to form a union without intimidation. Stand with us by adding your name to our petition, and share it far and wide after you have. 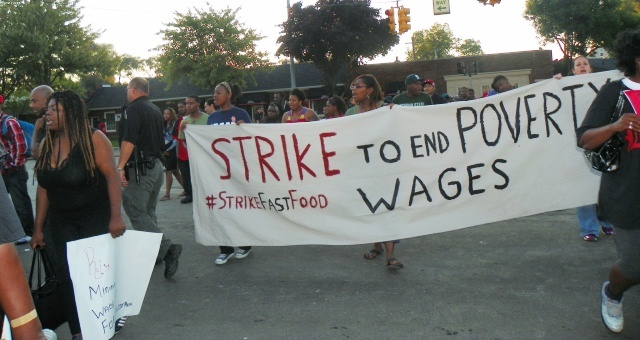 Click on http://strikefastfood.org/ for coverage of strikes across the U.S., and local contact information. This entry was posted in Uncategorized and tagged StrikeFastFood. Bookmark the permalink.